14K WG or YG Diamond Concave Ring.2.000ct of diamonds. 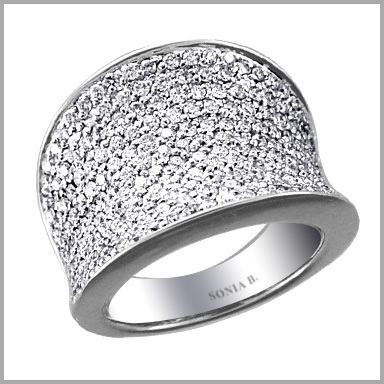 A captivating concave design of diamonds! Crafted in your choice of polished 14K white or yellow gold, this ring features 200 round cut diamonds in pave settings in a wide concave band design down the center. The total diamond weight is approximately 2.000ct with a color of G-H and clarity of SI. The setting size is 11/16" x 15/16" with a height of 3/16"